Champions were crowned at the Dodge Mile High NHRA Nationals at Bandimere Speedway on Sunday as the NHRA professional tour cruised into Denver to kick-off the ‘western swing,’ dazzling fans with incredible speeds of over 300 mph. Leah Pritchett took down Denver in top fuel, not only qualifying No. 1 overall, but standing at the podium when the dust settled. Pritchett drove her 1320 “Angry Bee” Dodge dragster past Doug Kalitta in the finals, running 3.831 at 316 mph for the win. Pritchett was complimentary to her team in the win and brought them up on stage when celebrating the win. 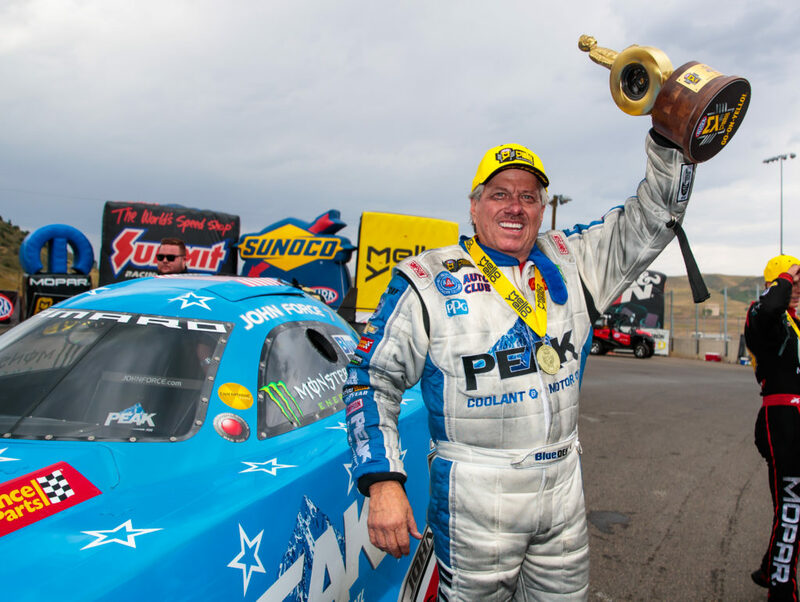 John Force in his Peak Coolant funny car notched another win in his historic career, win No. 149 in his career as he drove past Ron Capps NAPA Auto Parts funny car in the final. Force has struggled this year with multiple crashes and poor performances, but a recent phone call describes Force gave him new found motivation to climb out of his slump and return to the stage a winner. “After my last crash, John Bandimere Jr. calls me and says we got to talk…When you get to Denver, you will be fixed. Now go out there and show them who the real John Force is,” Force said. Force and Bandimere Jr. share a special bond and both are historical figures in drag racing in their own ways, impacting the sport and helping grow it to it’s greatest heights. Bandimere Jr. works as Chief Spiritual officer at the race track after spending multiple decades building the track to what it operates as today as one of the most premiere race tracks across the country. Bandimere Jr. also races frequently and most recently was elected into the NHRA division five hall of fame. Once the nitro-methane cleared, factory hot rods hit ‘Thunder Mountain’ in pro stock car when as fans were treated to an all-Summit Racing final between teammates Greg Anderson and Jason Line. Anderson had the slightly faster car in the final running 6.943 to Line’s 6.947, but also was first off the starting line and packaged it for his 91st career victory in pro stock. Pro stock motorcycle finished before it even began, but was much closer than you would believe. Hector Arana Jr. collected his first win in 2018 when Jerry Savoie red-lit in the final -.004, leaving .002 quicker than Arana Jr. who also red-lit, but because Savoie did it first. He is dubbed the round runner-up, giving Arana Jr. the Wally. Local racers Brian Percival (super street) and Rick Milinazzo (top dragster) also collected wins in the sportsman categories in the 39th running of the event.